Villa, 2 chambres + autres (voir description), 2 Bains (Sleeps 5-6). SeaBreeze Villa est une belle droite de la maison sur la mer des Caraïbes. L'unité est de deux chambres sur 2 niveaux, il y a une cuisine complète, salle de séjour, salle de bains et une chambre d'hôtes à l'étage principal. Tant le salon et la chambre d'hôtes ont des portes françaises doubles qui mènent sur le pont principal donnant sur la piscine, la plage privée et la mer des Caraïbes. La 2ème chambre est une chambre en mezzanine avec une belle salle de bains (double douche) et un balcon privé donnant également sur la piscine, la plage privée et la mer des Caraïbes. Besoin de plus d'espace? Il est un studio disponible au rez-de-chaussée. Le studio dispose d'un lit queen, plein coin cuisine et salle de bains. Les doubles portes françaises mènent directement sur la terrasse de la piscine. (Nous ne louons l'unité de studio pour les invités de la chambre 2, si elles ont besoin de plus d'espace.) Si yo ne nécessitent pas le studio, nous ne le louer pendant votre séjour. S'il vous plaît nous contacter pour les tarifs et plus de détails. NE PAS OUBLIER: HOMARD FEST EN JUIN - beaucoup de plaisir pour tous! Il y a quelques restaurants exceptionnels à quelques miles, ainsi que beaucoup d'épiceries à une courte distance. L'aéroport de Placencia est à seulement 20 minutes. station d'accueil pour iPod, Internet sans fil, piscine avec bar, coffre-fort privatif, Belize téléphone portable, Shaw (Star-Choice satellite, d'épices et de cuisine agrafes. Il ya aussi une salle de lavage pour votre usage pendant votre séjour. My idea of a dream location for a family vacation. Private sandy beach, pool, house. Lots of room, open beautiful interior. Friendly property manager, and grounds keeper. Also a great location for day trips to locations south of Belmopan. We had a wonderful week staying at this beautiful house. The owners were very accommodating about any questions we had before we got there for our visit. The house was exactly as pictured, great accommodations for everyone. Lus met us and was helpful with local information. The seaweed was cleaned up daily, however, this time of year it is very windy and the waves are large so we spent our time at the beautiful pool. We rented a car, which is necessary as the house is located in Northern Placencia. It takes only minutes to get to the village and a few more to get to the end of the island. We did the Mayan Canopy Zip line and river tubing. It was a fantastic experience. Got great rash guards at the Tipsy Tuna Restaurant/store. Dave and Yvonne thanks for a great stay!!! Waterfront pool, palapa, ocean breezes - what's not to love? Great house! We spent a lot of time in the pool, under the palapa, and on the multiple decks and balconies, taking in the views and breezes. The house lived up to its name, offering cool sea breezes that felt great after long hot days. With the ceiling fans going and windows open to the breezes, we never once needed the AC. Beds were super comfy, and both bedrooms had balconies overlooking the ocean. Just lovely. The upstairs bedroom is loft style. We didn't mind a bit, but just an FYI for those who prefer walls and doors. We had hoped for snorkeling off our beach, but didn't see a thing. You really have to hire a boat and go out to the reef for that. The owners recommended their friend, Alren, who picked us up by boat, right in front of the house, and took us out for a day of guided snorkeling and a great lunch on the beach. We also went on a couple of dives with Seahorse, in the village. We did see a few manatees poke their heads out of the water a couple of times in front of the house, but no close encounters. On land, we had a few nice visits from a local iguana. The house is located on the quiet end of the peninsula, which we loved, but it does mean you'll need transportation to get to the village (about a 25-minute drive) and to restaurants (some of the best ones are less than 10 minutes away - Maya Beach Bistro was our favorite). We relied on taxis the first few days - the driver who picked us up at the airport gave us his number and picked us up whenever we needed a lift (shout out to Big Mike!). Expect to pay about $25 per trip. We rented a car for the last few days. Overall, it was a great vacation. We could not have been happier with the house and the beautiful, peaceful setting. We were vacationing with a total of 6 adults. We loved the property. the beach is very private, views are amazing. The accommodations were very comfortable. Loved the pool. We enjoyed evenings on the porch playing cards then viewing the brilliant stars like we've never seen before! Our day long ocean excursion with Alrin was awesome...snorkeling, fishing. We highly recommend it. Worth every penny, with out a doubt. We enjoyed a little bit of shopping and dining in Placencia. Tutti Fruiti's gelato is the best I've ever had. And The Bistro At Maya Beach was the best...we went back twice. Overall, a heavenly experience. We made some wonderful memories! The seabreeze villa was a perfect January getaway! Thank You Holly, We are very happy that you enjoyed your stay and hope you enjoyed Belize. Many thanks to you and your group. We stayed here in January 2019. Had a great time. Spent most of our days sitting on the beach looking at the water and relaxing. It was extremely quiet and peaceful the entire week. We did see the neighbors on both sides, but never heard a peep from them. The views from the beach, the pool, the 2 decks, and the master bedroom loft were incredible. The permanent shelter on the beach came in very handy on the one day that we had rain and allowed us to remain outside by the water during the rain. The area was amazing. It is about 25 minutes all the way into the Village of Placencia which has some great restaurants and all along the way there are several restaurants that are very good. One thing that was important to us was whether or not we could go into the ocean from the beach at the house and swim. I couldn't find any previous reviews that mentioned this. I did inquire with the homeowners and was told that we could absolutely swim off the beach. This did not turn out to be the case. The water was very murky and nothing that we personally would go in. However, we visited the beaches at several of the small resorts and hotels in the area and the public beach in Placencia and they were all the same, so this definitely was not something abnormal about this specific house. It just appears to us that as beautiful as the views from the beaches are, it does not seem to be the type of place you would go to spend time in the water. This was a little disappointing as that was the main purpose of our vacation and we did not step one foot in the water all week. That being said, we simply adapted our mindset and had an absolute fantastic week. We still sat on the beach every day and soaked up the sun. It was perfect for that. We just cooled off and refreshed in the pool instead of the ocean, which was great. The people everywhere were so nice and every restaurant we ate at was really good and affordable. Would definitely recommend this place! Thank you for your review of our property. I'm glad you enjoyed your vacation and sorry you were not able to swim in the sea because of the murkiness of the water. We have been there dozens of times and lived there for over a year. there have only been a few times where we didn't swim in the sea for that reason. At times during the rainy season, which is just ending now, the rains in the mountains can sometimes wash muddy water from the rivers into the sea and depending on the winds,rains & tides it can move more sea grass onto the beach. The fact that you went to many beaches in the Placencia area and found that they all were like this shows that it was a problem all across the area and is not a reflection on the property. we have staff that clean the beach early every morning. It always clears up and is not always predictable, We do our best to make sure everything is in tip top shape for our guests but things like this are beyond our control. As a rule the water all along the Placencia peninsula is beautiful and clear. Need More Room: We also have a studio unit with a Queen Bed, breakfast nook & bathroom. 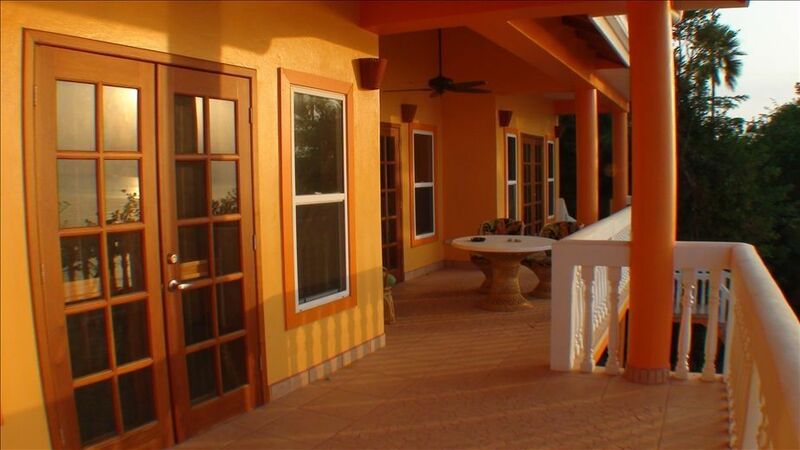 It has double french doors leading onto the pool deck overlooking the beach and the Caribbean sea. If you do not require the studio unit, we WILL NOT rent it out during your stay. Contact owner for more information.